Can I just say that being finished with my master's degree is an awesome feeling? It feels weird not logging on to Blackboard every single day to see if grades are posted or if someone has left a comment on my discussion post. Of course, I am still logging on every day to see if my last class has been posted to my transcript. I already know what grade I got; I just want to be able to order my transcript so I can apply for a new teaching certificate with my married name and new degree on it! Saturday, my husband and I drove to Texas so I could walk across the stage. Since all of my classes were online, I wanted to do *something* to make my degree seem more real. What could be more real than walking across a stage in front of thousands of people I've never met before? My parents, sister, and great-aunt also made the trip to watch me graduate. Given that these are the people who have listened to me complain about every single deadline and assignment, it was only fitting that they be there to see me finish. 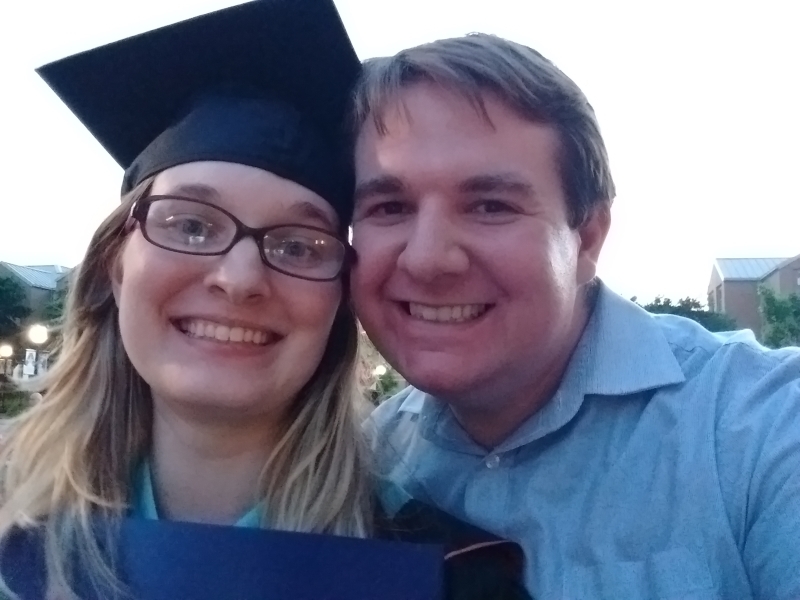 Shaun actually beat me to blogging about my graduation. So, you can read more about our road trip adventures to and from graduation here. The most challenging/frustrating/satisfying part of my master's program in curriculum and instruction was my action research project. We were asked to consider an issue we saw in our school and design a research project to investigate it. I chose to focus my research on the remediation of integer operations since it is an area where my students struggle each year. Specifically, I decided to compare the impacts of two different forms of integer remediation: use of the number line model and use of memorized rules. If reading educational research is your kind of thing, I've posted the entirety of my (56 page) action research project here. I've titled it "Investigating Effective Remediation of Integer Operations at the High School Level." Additionally, I've uploaded the resources I used to carry out the project here. I have to say I'm a bit hesitant to post my research project. Are there typos? Probably. I know I've already corrected a few for this blog version that I didn't catch before turning in my final version to my professor. Oops. Was the research project flawlessly executed? No. To be honest, I don't even know what some of the statistical calculations I was supposed to do even mean. Should I be admitting that? Probably not. But, I can say that I definitely learned a lot through the process. If I was to plan another action research project, I think it would go a lot smoother because I *think* I've finally wrapped my head around what a project like this entails. One of the problems with doing my master's degree online was that we didn't receive a whole lot of feedback as we were planning our research projects. My project changed shape and form so many times throughout the year and a half I worked on it. I went into the project knowing I wanted to do something with integers and nothing more. It wasn't until I started collecting data that I realized I needed to be a bit more focused. As a result, I ended up collecting a lot of data that I didn't end up using at all. Oops... Since I am a perfectionist, my first instinct is to be happy I'm done with this project and store it away on a shelf to collect dust since it's not perfect. But, that's not what the #MTBoS is about. We don't share things because they're polished and perfect. We share things because we want to become better teachers and help others become better teachers at the same time. So, without further ado, here's a peek into my research. My last assignment for my last class was to create a PowerPoint presentation to summarize my action research project. These slides don't tell the entire story. So, if any of this interests you, remember that there's a link to the entire paper above. 1. At the high school level, does the use of the number line model result in more effective remediation of integer operations than the use of rules to be memorized? 2. Is the use of the number line model more effective in the remediation of integers with students enrolled in higher-level math classes? 3. At the high school level, does the use of the number line model lead to a greater retention of integer operation skills than the use of rules to be memorized? If you read this far, can I just say thank you? Congratulations! I am impressed with your research, even if you don't think it's perfect! Thanks, Nancy! That means a lot coming from you! Congratulations!! That is awesome... I'm looking to get my masters too in curriculum and instruction within the next two years, how long did it take you? I really enjoyed reading the results of your study, Sarah. I know how you feel about being disappointed with the results not being statistically significant. I had the same problem with my masters thesis with respect to classroom management style. I also really like how the power point was laid out because it was easy to follow. I would have guessed that the number line would have been more significant over rule memorization. However, that's why we have and do research. P.S. Congrats on receiving your masters degree!!! Congratulations! Thank you for sharing your findings. I would have thought that the number line would have been a clear winner, but this is interesting that it wasn't. Congratulations on your masters! I received mine 6 years ago and had to do an action research project also. Like you, I had no statistically significant results. I think it is because wea re limited to our classrooms and have such a limited number of students to use for our subjects. Anyway, I have found that here in Vietnam, my students in middle school do not even like the number line for adding and subtracting. Give them counters of some sort, and they are happy! Also, they are more successful and can develop the rules on their own. It may be that they are in a culture with extreme value placed on math and English proficiency, as well as education in general. Sarah, I was very interested in your study as a special education math teacher. I was hoping you'd have found "the answer". I think that your results weren't statistically significant because both groups were doing some sort of remediation which is like infinitely better than doing nothing. Congratulations! I am always amazed by and thankful for your ideas. Thank you for sharing your love of teaching math! BTW, you have to update your "about me", since you no longer have an amazing "fiance"!